You love the beach. 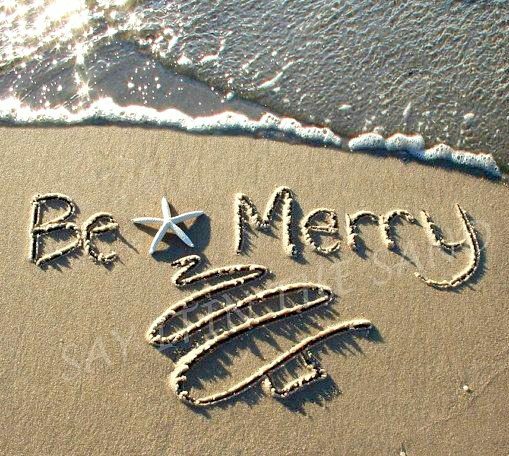 So how about sending out your seasonal wishes with a Christmas beach photo card? 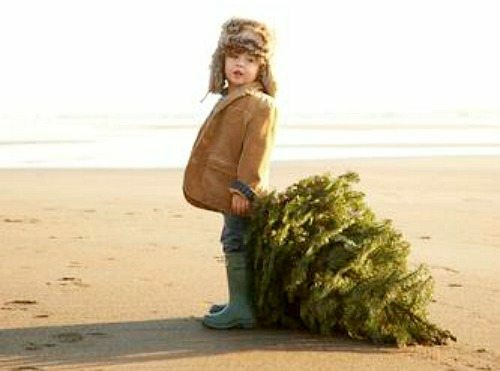 These crazy cute Christmas photos taken on the beach are inspiring and will make you smile! 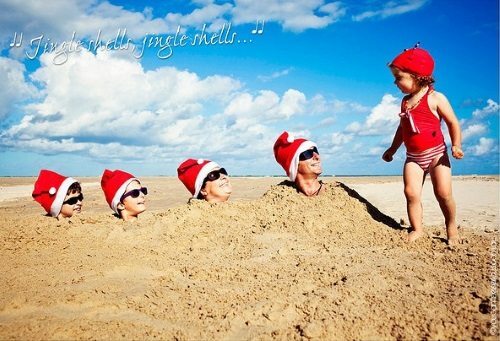 Humorous family Christmas beach photos, still lives of mini trees, ornaments, Santa caps, fabulous sand drawings and more. The sky is the limit to how much fun you can have with selfies, toddlers, babies, dogs, and family beach Christmas photo shoots. Some folks, of course, hire professional photographers to do this. Photo by Eva Praskova via Flickr. By You Can’t Be Serious via Flickr. 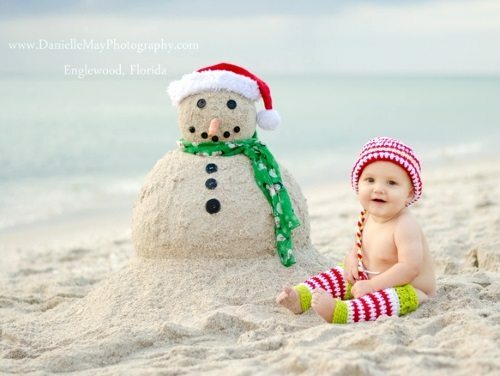 Baby with sandman by Danielle May Photography. To make a nice round head for the snow sandman, spray a ball with adhesive, and roll it in the sand. Via Travel by the Real Deal. 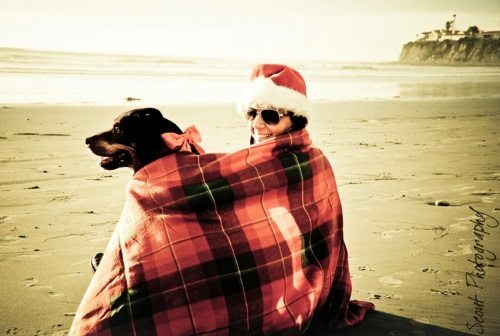 Christmas photo with dog by Stacey Webb of Scout Photography who specializes in artistic lifestyle photography. Photo by Thayer Allyson Gowdy for Toddler magazine. Photo shoots with cute mini Christmas trees. Photo by Amy Clark via Flickr. 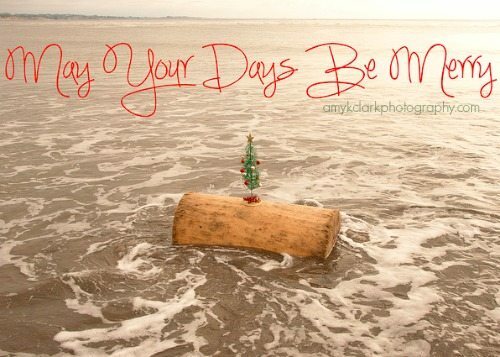 You can go to Amy’s Holiday Gallery and order a photograph as a Christmas Card! 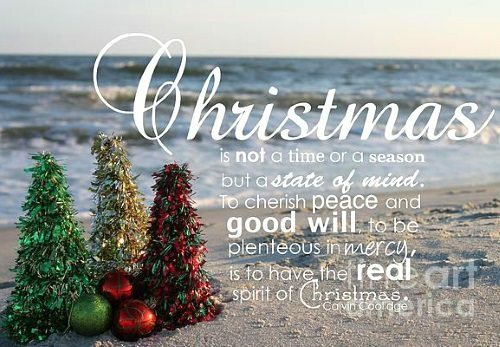 Beach Christmas quote card by Ashley Barrett. 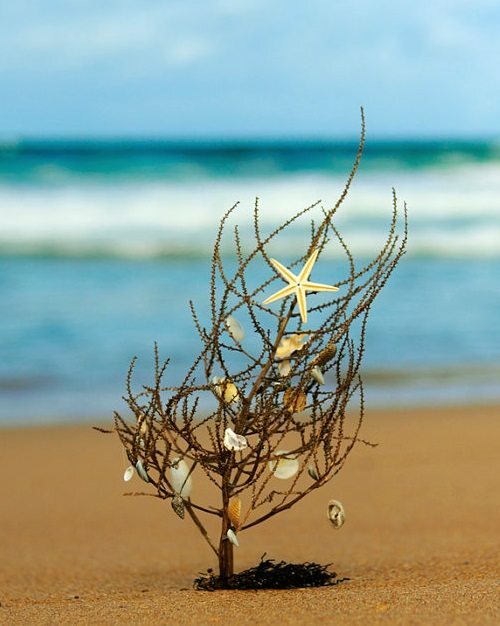 Mini Christmas tree on the beach with presents. Via Flickr. 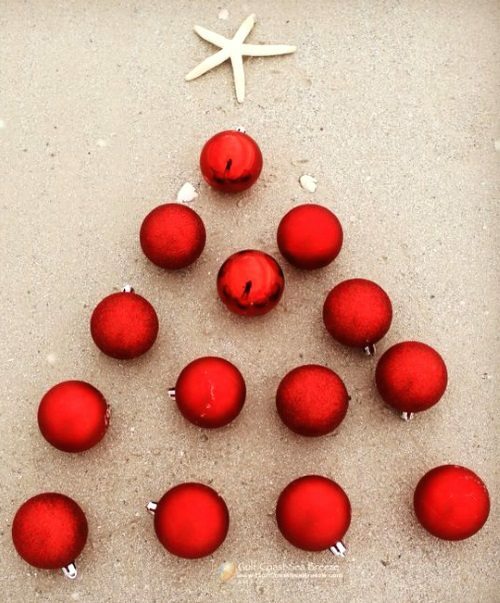 Sweet tumbleweed Christmas tree, photographed by Anita who creates lovely whimsical Beach Christmas Cards. Use your Christmas ornaments as props. Shoot close ups, group a bunch of them together, or photograph ornaments from a distance. Photo by Ken Butler, available as card. 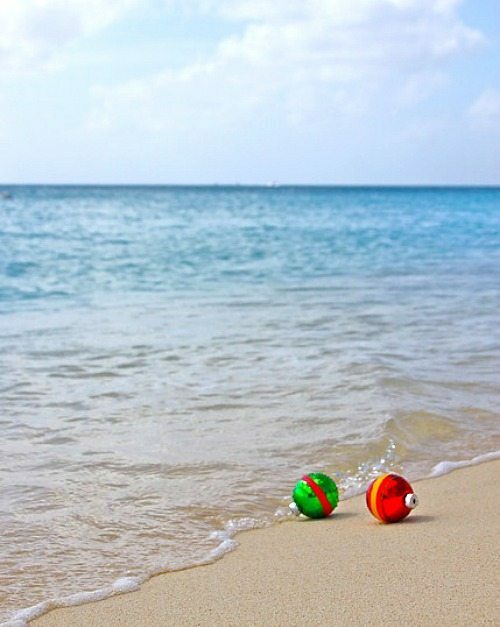 Another beautiful Christmas ball vignette on the beach by Ken Butler. 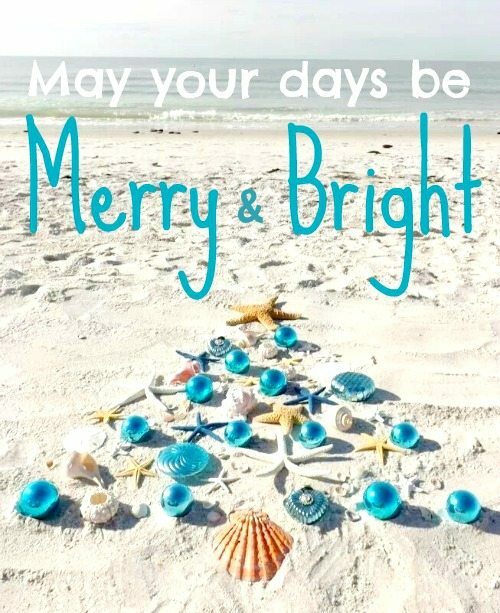 Via Gulf Coast Seabreeze on Facebook. 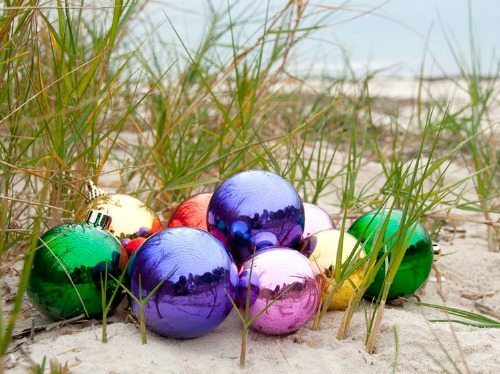 I believe that this photo of ornaments on the beach is by Muffy Sadler. 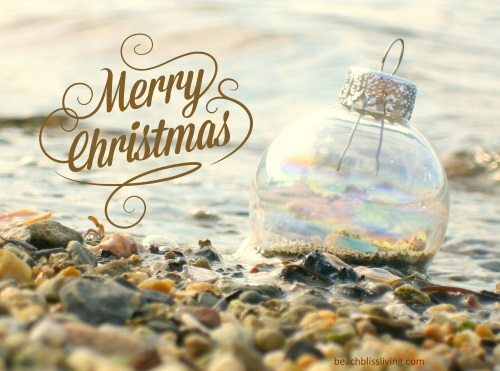 I took a Filled Clear Ball Ornament to the beach for this Beach Christmas Card. 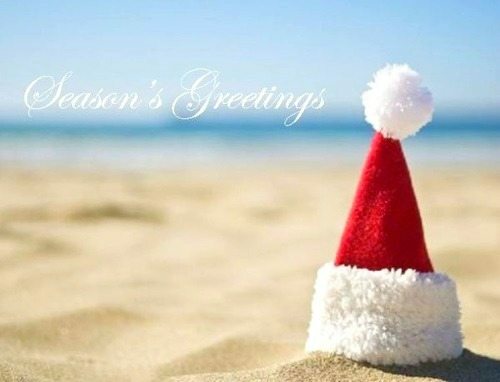 Santa’s red cap looks stunning against the blue sea and sky. 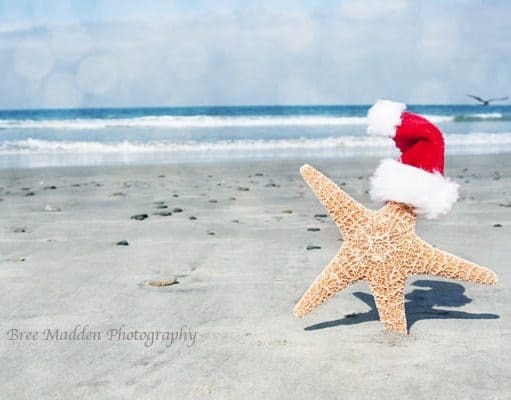 So go ahead and take some cute beach Christmas photos with a (mini) Santa cap. Found here. Photo by Bree Madden via Flickr. Bree also has an Etsy Shop where you can purchase her beautiful photographs as prints. 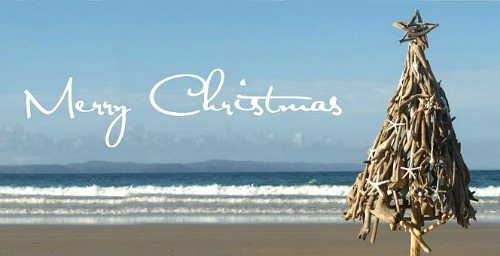 Or insert a digital Santa cap into your beach photograph wherever you see fit, like I did for this Christmas Card, using Pic Monkey. 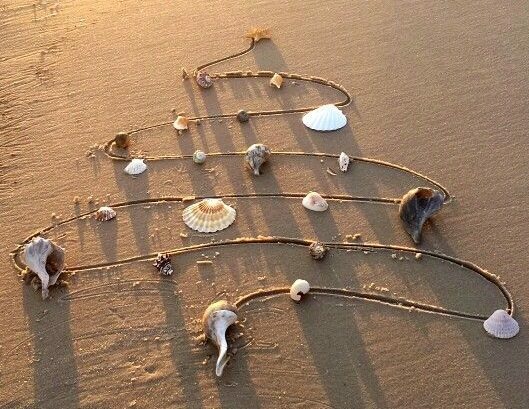 Use the sand as your canvas to create something awesome. 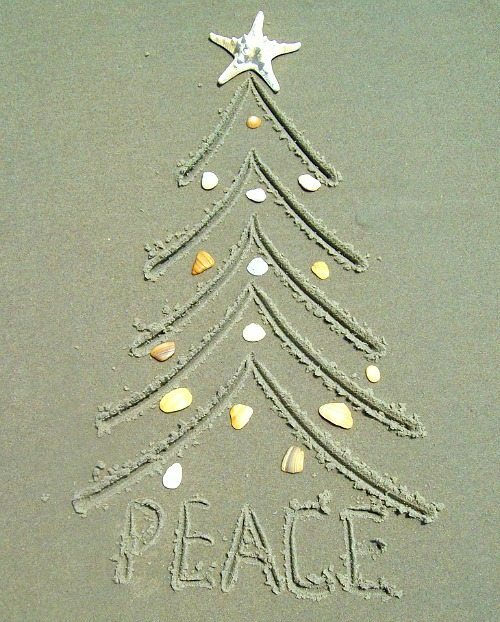 A masterfully drawn Christmas tree in the sand, decorated with ornaments. Also from Ken Butler’s Christmas Card Collection. Via Pinterest. Original source unknown. By Say It in the Sand. This photo was entered in the 2012 Ocracoke Island Photo Contest. 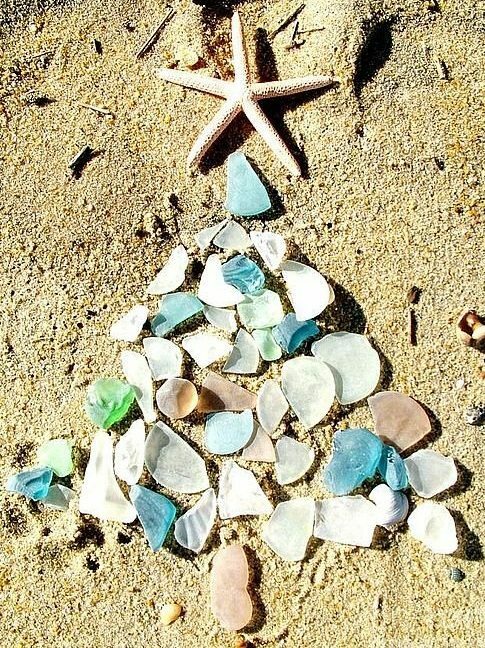 A beautiful seaglass Christmas tree by Rose Hibbetts, available as a card. 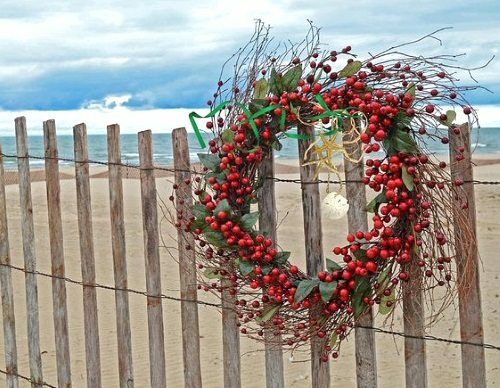 Take anything Christmas-y to the beach and photograph it. Berry wreath card by Maria Dryfhout. Photo by Carol of Art and Sand who’s cottage is featured here. 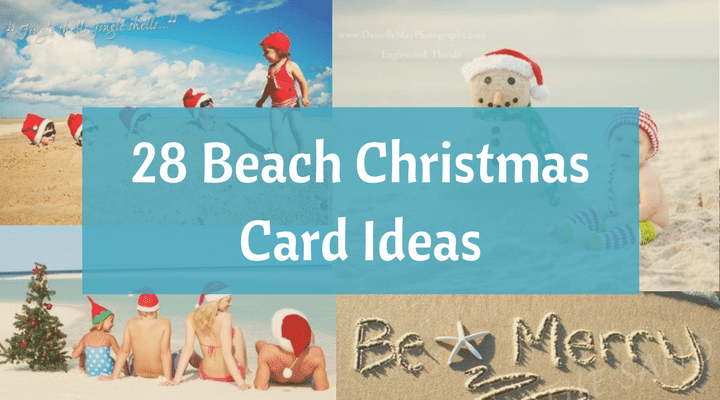 And there are endless ways how you can design a beach Christmas card with a photograph you took on the beach. Also made with Pic Monkey, and available in my Beach Bliss Living Zazzle store here. 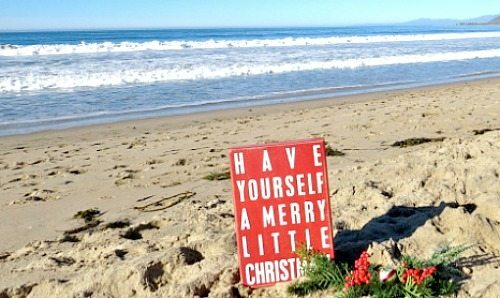 If you don’t have a printer at home, you can create your own beach Christmas photo cards with the help of sites like Minted where you can choose from a sea of Holiday cards to personalize with your own photos. 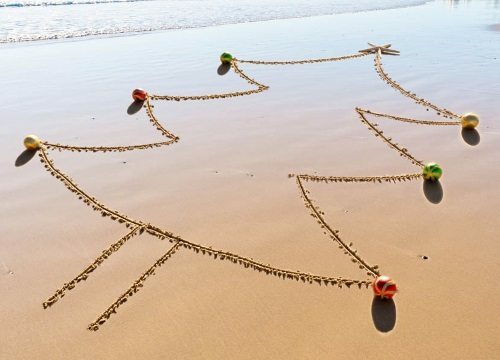 And should you have a great beach Christmas picture, I’d love it if you shared it with my readers and followers. Feel free to upload your photo to my Facebook page or email it to beachblissliving@gmail.com for a possible feature on my blog. 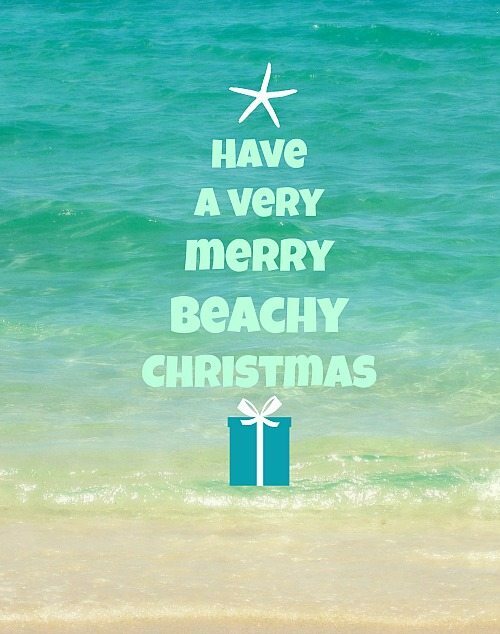 Looking to buy cute beach Christmas cards? 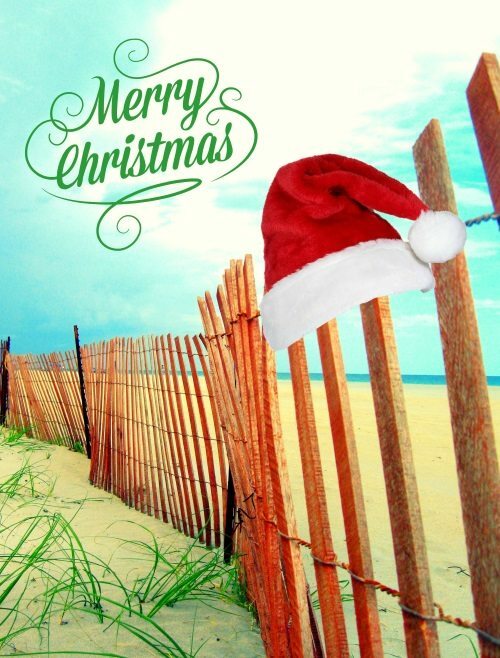 For a huge selection of all kinds of Christmas cards in boxes, head over to Amazon. 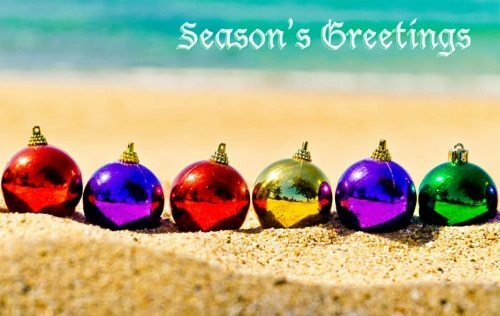 Or search Zazzle for beach Christmas cards. There is no minimum order there, plus you can customize your card if you wish.